As we are beginning this holiday season, let’s remember to thank the unexpected people in our lives: the teller at the bank, the cashier that’s scanning your holiday items, your children’s teachers or babysitter, and all the other people who might have work before being able to celebrate the holidays with their families. I also want to again thank our Veterans, as well as our other service men and women who serve our communities as EMTs, firemen, police officers, nurses, and doctors. And to remind all of you that we should be thankful and grateful every day, not just simply on Thanksgiving. As a note, remember that if you’re out hunting this week, keep your eyes peeled and stay safe. Many of you might be dragging your venison out of the woods in the dark, so don’t forget your head lamps and a cell phone to call for back-up if you need it. Finally, I encourage everyone to jump on the band wagon, so to speak, with my family. Since my step-father passed away, my mother decided to share stories from her family, about her parents growing up, her early childhood, the cool stories she knows about our city and the places she has lived. She says she wants to give us these stories before she forgets them. So, tell your children those stories you may think might be unimportant. They may teach your children something new about you and their family, like my mom has with my sister and me. 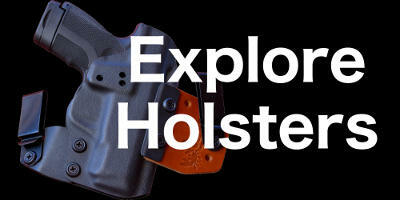 Happy Thanksgiving from the Clinger Holsters family! Eat well and stay warm! What’s your favorite family story involving hunting or other shooting activities?